Watching for subtle signs in body language such as the raised head feathers shown in this photos of Suki, the blue-fronted amazon. Question: Hi Lara! I have a bird “attacking” question. I’ve had my Amazon since she was only a few months old. I did have a couple of biting instances with friends and kids, so I’m pretty much the only one who handles her now. In the last few months the problem has gotten much worse. She’s fully flighted. 26 months old. I do not seek out interaction with her – at least not interaction where I am holding her. But she flies at my face constantly, lands in my hair and attacks my ears. She also attacks my hands repeatedly. This is not nipping. This is grabbing my fingers in her beak and grinding to the bone. And this has become EVERY interaction. I have a house full of other parrots and dogs and I spend 98% of my time trying to deal with this bird. I’ve taken a behavior analysis parrot class. Studied all the ABA papers. I don’t use any kind of punishment , I don’t force her into anything (well, only if she’s got me to the bone, and then it’s only prying her beak off of me). All of her physical interactions with me are because she flies to me. Her diet is well rounded (chop, Harrison’s pellets). Her meds check out fine with the vet. When I train her with positive reinforcement, she actually gets more aggressive (tail fanning, eye pinning and snapping). She’s also impossible to motivate unless it’s something she REALLY shouldn’t have like butter or meat. I can spend a great time with her, working on staying on the hand without biting, doing something OTHER than biting like holding a toy or keeping the head up. Nope. She nails my hand over and over again. By the way, she does also express breeding behavior with me. Wings down, panting, regurgitating. I don’t encourage it, but it’s hard to get her off me at times and since there’s always a huge bit involved, I’m gun shy. I’ve done everything. I’ve tried to be quiet and calm. I’ve tried to be peppy and upbeat. Everything seems to upset her. I’ve asked for help – but am shamed by the behaviorists who tell me that “I’ve created the problem.” It’s humiliating when I’m trying to do everything to save this bird. I’ve always wanted to be part of the parrot solution, not the problem. I have excellent relationships with my other birds (even hard cases from rescues). I really don’t want to give her up since I’m afraid she’ll be passed from home to home, but I don’t know what to do and my hands are sore and bleeding constantly. I need to give some attention to the other animals in my home. I need to read a book or watch TV without being attacked. So many areas to begin but first I want to commend you for seeking help. Your determination is obvious and I admire your dedication and persistence in working with your amazon. You definitely have a serious situation and let me see if I can offer a few different things that may help. I am sorry to hear that anyone in the field of giving behavior advice has shamed you for or about seeking help. I’m glad their intention has not worked because what does this solve? 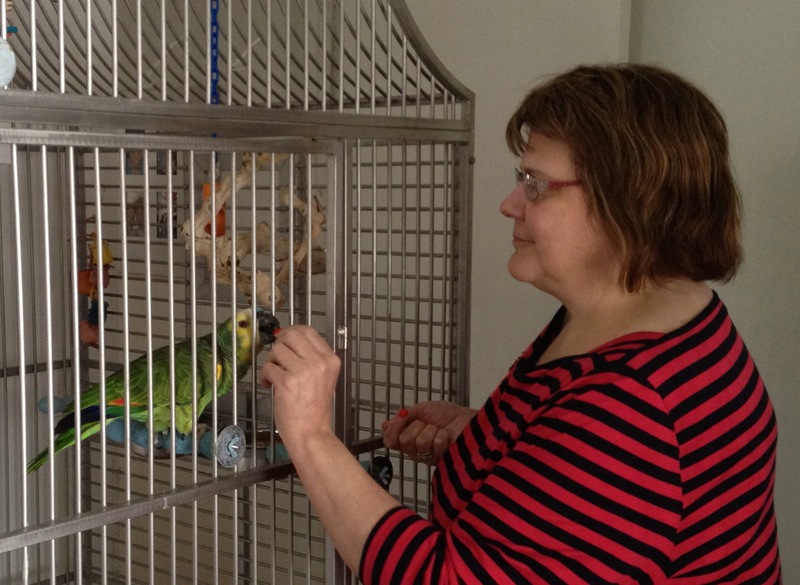 Our goal as behavior analysts and modifiers should be focused on the best for the bird and their caretaker and giving the help needed to help create a stronger relationship so the bird keeps it’s home and the family can live happily as a whole. 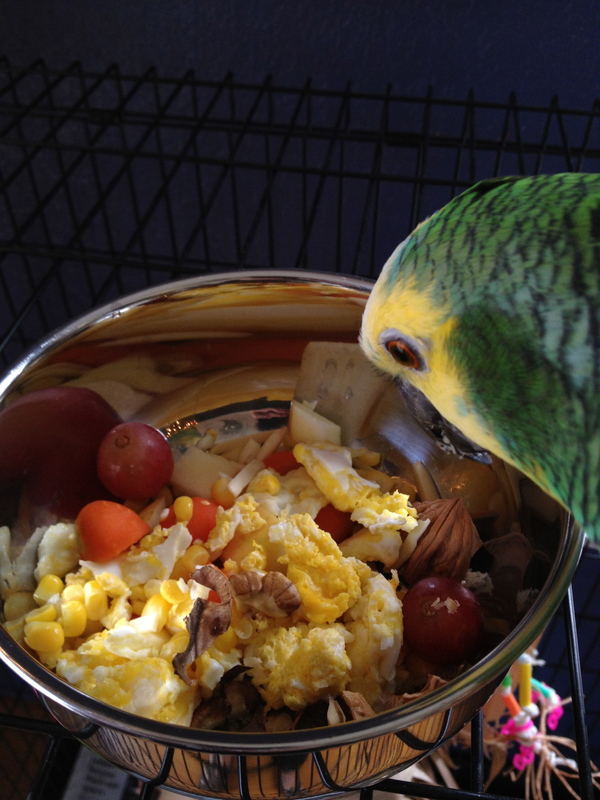 Watch what your birds eats from its food dish first. Those are potential valuable reinforcers that could be delivered throughout the day to reward behaviors you want to see increase. intently at it. Body language can be so subtle but it is one of our (as owners/caretakers) biggest clues as to what the bird is trying to tell us. Julia, when I first meet a bird and before I begin interacting with it, I watch it. I observe how it’s body language changes as it interacts or observes its immediate environment. What does the bird look like when a loud sound startles it? How does that bird react when someone stops near its cage or playstand? What does the feather placement look like when it is preening, sleeping, or relaxing? What does the feather placement look like when it is not relaxed? I need to learn as much as I can about the bird’s body language because I am more than likely getting ready to interact with it. looks like when it seems to be enjoying what it is interacting with. I look at all of this as a form of communication from the bird to myself and how I respond to that body language is a form of communication to the bird. I pair learning the bird’s body language with use of the bird’s reinforcers. If the bird walks to his food dish I try to look to see what it first picks out of the food dish. Was it corn? Was it a nut? Or was it to make one swipe of its beak and push the majority of its food to the cage grate? Each of these three items are very important and we can learn from each of them. If the bird first goes for the corn, guess what the bird doesn’t get in his food bowl tomorrow morning? Yeah, corn! If that corn is valued by the bird, it is going to be of more value to the bird if it hasn’t had any in several hours. The sound of your voice, the tone of your voice, or how enthusiastically you deliver attention can be a very effective reinforcer for behavior. Photo courtesy of Viki Bullock. As you have learned from taking the classes you have, reinforcers can be more than just food. One of my bird’s most delivered positive reinforcers from me is my voice. Actually it is more than just my voice. 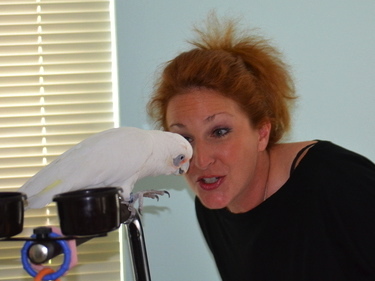 It is my tone of voice and the variance in how I use it when interacting with my birds from different rooms. I’m mentioning this because our interaction with birds and beginning to rebuild that relationship with our bird does not have to be ‘hand’s-on’ in the beginning. I am suggesting this is one of the approaches you take with your bird. When your bird makes a cute noise, respond to it vocally. You don’t have to get up. You don’t have to walk over to the bird’s cage. Just repeat the cute sound and watch how your bird reacts to it. When it does it again, repeat it. How does he react to it? Does he react to it? Try it again. If he begins to react to it and repeat the noise, guess what? That noise is being reinforced and if your bird keeps doing it, he might be enjoying this ‘hand’s-off’ communication and interaction with you. This doesn’t mean you shouldn’t touch your bird again. This just starts paving a new form of communication between you and your bird. Touching and physically interacting with the bird needs to be re-shaped as I explain below. Remember that corn or that nut that he first ate from the food dish? Begin incorporating that by pairing it with yourself. Keep those favored foods and ration them out throughout the day and incorporate them into your training plan everyday. What I mean by this is, when you need to walk into the room, or by the cage, set a piece of corn (or whatever the favored food item is) on the cage, the furthest distance between you and your bird or at a distance where the bird’s body language remains calm. You don’t want to push this area of comfort to where the feathers raise on the back of the neck, or the eyes pin, or the feathers begin to stiffen up. Begin at a distance where you know the bird is going to stay calm and comfortable while you place the corn, nut, etc. on a cage rung and pass by. Bingo! That was a training session. Training sessions do not have to be long. Most of mine last ten seconds to a couple of minutes. The importance is not in the length of the training session but the frequency throughout the day. Rebecca target training Suki, the blue fronted amazon from inside the cage. She’s delivering the reinforcer between the cage bars to better learn Suki’s body language before getting her out and interacting with her by recall training her. or a small sliver of a nut several times a day. Then take it to the next step and begin setting the food reward closer and closer. Then get to the point where you can hand it through the cage bar. The cage bars are nice and a place to really learn to see if your bird will take the food from your hands without biting you. Hold the treat far enough away that the bird can’t bite you just in case you misread the body language. You don’t want the bite to happen at all, but this is a great way to make sure you are reading body language correctly before moving to the next step. Soon, you can open the cage door and set the food reward down on the perch and then walk away. Soon handing the food to the bird inside the cage, etc. There is more training that can happen but it could take me several pages to write. Remember, the bird is always the one that decides the reinforcer, never us. We can reserve the reinforcers and give at times of training and this is how we can make that reinforcer of higher value to the bird. Just as it is the bird that decides the reinforcer, it is also the bird that decides the aversive. An aversive is something the bird doesn’t like, as you may already know. Watch the body language and the bird is going to be the one that tells you if he or she sees something as an aversive and when he/she does, you really don’t want that paired with you if you are trying to re-build a relationship. Julia, if you go to my youtube page (LaraJosephBirdLover) you will be able to see several videos of me working with birds that have a long history of aggressive behaviors being reinforced. Take a look at some of my training videos of me with Molly, my eclectus. Take a look at some of the videos of me working with Willy the turkey vulture. I know it’s a turkey vulture, not a parrot but the approaches in training and use of reinforcers and arranging the environment for successful outcomes is the same. 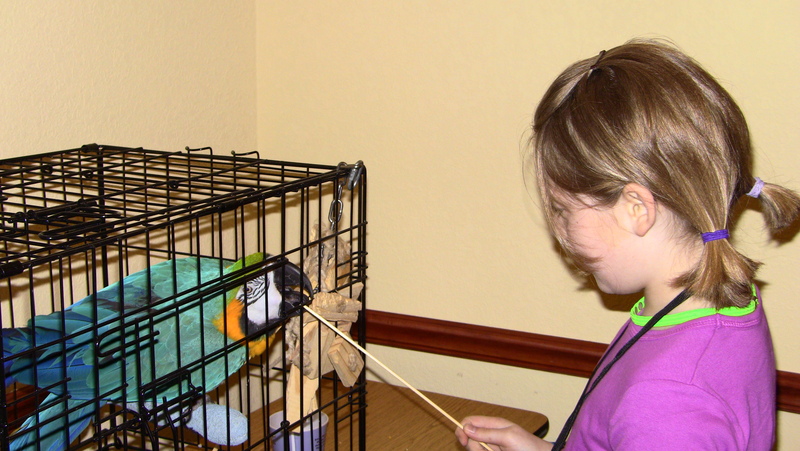 Hailey training a blue and gold macaw to touch its beak to a stick. This is also called target training and is a handy tool to use, especially working with birds who have a history of showing any signs of aggressive behaviors. This allows the trainer to request behaviors with no contact and the target can guide the bird to different areas of the cage or room. Without turning this reply into a book, I wanted to mention target training her. Train her to touch her beak to an object on cue, such as a stick. If she doesn’t like the stick you can re-shape the behavior of her staying calm while touching her beak to a stick. You can also shape the behavior of her touching the top of her beak to the stick if she is tending to want to bite the stick and pull it in the cage. This would help not only in redirecting her attention when you think she’s getting ready to bite you, this will also help when you think she might be getting ready to drop her wings and start panting. Don’t wait until either of these behaviors happens. Ask her to target when you think the chances are high of either of these behaviors happening. And just like crate training, don’t wait to begin crate training when it’s time to go to the vet. Crate train when a vet visit isn’t even scheduled so that way when it’s time to go to the vet, the training is already set in place. Don’t wait to target train when she’s on your hand and getting ready to drop her wings. Target train her after you have already trained her to stay calm when you pass by her cage. As far as working with reinforcers that aren’t the most nutritious for the bird, start with what works while gathering and making a list of others. Watch what she eats first out of her dish. Watch what she eats second. Pull those and reserve those for reinforcing throughout the day. Mix those in with what already works while slowly weeding out the not-so-nutritious. Once again, I want to commend you for all of the steps you have taken so far to attempt to make a difference with your amazon. I understand your pain, frustration, and this emotional roller-coaster ride. I know that first hand. You, and situations like yours, are the reinforcers behind why I continue to do what I do. 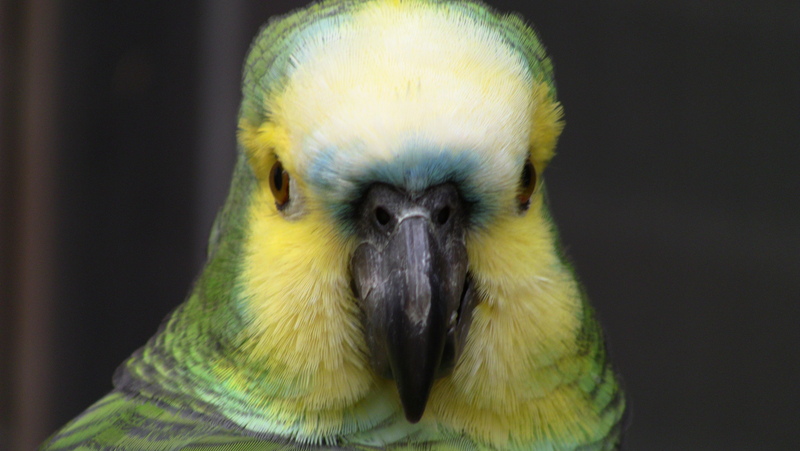 Before I bring this post to a close, you may want to join me on my Avian Behavior, Training, and Enrichment page on FaceBook. I try to post behavior issues, training approaches, and different videos several times a week to help people. I have two birds I inherited from a sort of grandma figure and they are very aggressive do to my dad and his ex’s son abusing them like hitting on there cage and yelling at them it’s been two years now and they trust me way more and my dad doesn’t yell at them or hit there cage anymore and they trust me enough to let me grab there bowls and water bowl and they will take food from my hand and they’ve never bit me before but I’m sure if I tried to let them walk on my hand they would bite me but I want to know how to get closer to them so I can let them out of a cage because even though it’s a nice cage they need freedom or I’m sure their behavior will stay bad so any advice? Hi Marianne. You can definitely work with these birds and make continuing progress. I would highly suggest interacting with them using positive reinforcement. Reinforce every interaction and get them slowly coming closer and closer to your hands until they are stepping up for you. A coworker’s African Grey was re-homed with me at the age of 28. I have had him for 7 months now, and he seems to have adjusted pretty well. My friend said he has never been an affectionate bird. He will get on my shoulder and sometimes let me scratch his neck through the bars of his cage. Tonight while he was on my shoulder he just started attacking me. I have no idea what set him off. He has never done this before. He went after my head several times and pulled my hair. It has made me afraid to trust him again, as I could have been seriously hurt. I wish I knew what caused this behavior. Any advice you can give would be appreciated.